Before we eat, many people work very hard―planting grain, catching fish, tending farm animals, and filling crates of vegetables. 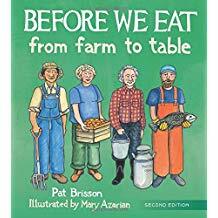 This book reminds us what must happen before food gets to our tables to nourish our bodies and spirits. This expanded edition includes back-of-book features about school gardens and the national farm to school movement.